If you have purchased DCL Pro, you will need to activate your product to get updates and priority supports. Otherwise you may able to use the plugin but you will not get any updates, if we have released a new feature or even a bug fix. To activate your copy of DCL Pro, follow the below simple steps. 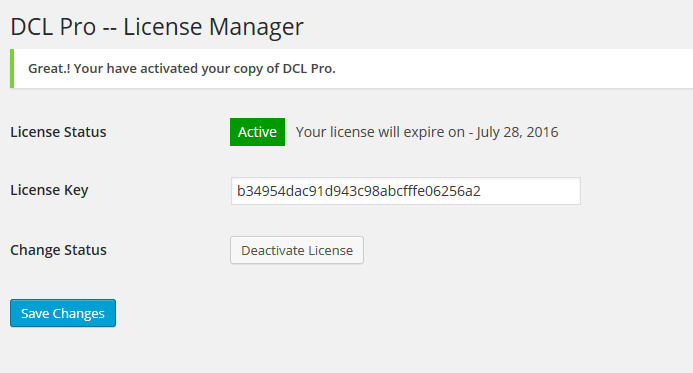 First go to DCL License tab in your DCL settings menu. Once you go there, you will be presented with a form that allows you to enter your “license key”. To enable automatic plugin updates, you will need to activate your license using the license key you received after purchasing the plugin. Check your purchase receipt email and copy the license key. You can always resend receipt using this form. Enter your license key in the form and click on save changes. After saving, one button will be shown saying “Activate License”. Click on that button and you are all set. If your license is valid it will be activated. See below screenshot.